Definitely not a drink I was particularly familiar with, and certainly not one that I’ve had the opportunity to sample in different versions. On Tuesday the 27th March 2018 the Japanese Ambassador Mr Yasuhiro Shimizu, Sake Master, organized a very enlightening sake tasting, which I had the honour of attending. I know that the Japanese adhere to protocol, thus my first task was to read up a little on the protocol of being invited to a Japanese home. Thank goodness for the net. It's amazing what information you can come up with. There are so many videos on how to bow, how you need to wait to be seated, how you should make sure to have a business card with you, etc. I started off with some confidence. The minute I was seated the politest lady came up to me bowed, smiled and offered me her business card. It's a way for Japanese people to introduce themselves at social/business functions. I don't remember if I bowed both when I offered my card and when I said thank you. But, I had my business card at hand! The idea behind the tasting was to show that sake can pair beautifully with any cuisine – not just Japanese, and in our case, with Greek food. So after the initial tasting we were asked to sample certain Greek delicacies with each of the sakes from the tasting. The Ambassador started his presentation by telling us a few words about how to acquire the knowledge and accreditation of Sake Tasting and the Sake Diploma. There is a certified Sake Master Course in London. Apparently the beginnings of sake date as far back as 300 BC, with the birth of industrialised sake taking place after the Second World War. The main ingredients are rice, water, koji mould, yeast. The quality of the water used for the brewing of sake is of utmost importance as it comprises 80% of the final product and huge amounts of water are used in all stages of the brewing process. The rice has to be milled/polished before it is used. This means the outer surface is polished off. The amount of milling is referred on the label of a sake. When 70% is stated on the label it means that 30% of the rice kernel was milled away and 70% is what is left. Milling influences the taste. Less milling will give a more earthy taste, whereas higher milling will result in finer aromas. After milling the rice is washed, soaked, steamed and then the koji mould is added that will convert the starch to fermentable sugars. Then a yeast starter is created (shubo) and the mash (moromi) will need about 2-4 weeks to ferment to an alcohol level of 16-18%. Then the mash is pressed, filtered and pasteurised. Sake may or may not have Brewer’s alcohol added, which affects flavour. Those with no Brewer’s alcohol added are richer, creamier, more savoury and grainy in their taste; those with Brewer’s alcohol are cleaner and lighter tasting. 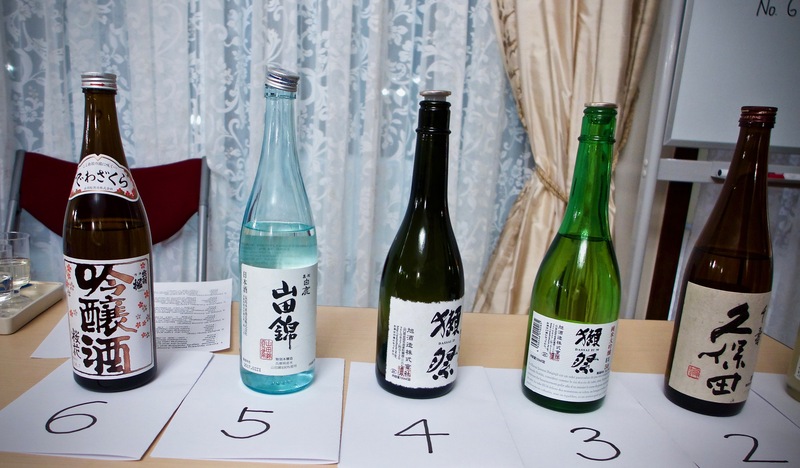 The are different types of sake: Junmai-shu has no brewers alcohol added. Honjozo-shu has 70% left from milling and has added Brewer’s alcohol. Ginjo-shu has 60% or less left from milling and added Brewer’s alcohol. Daiginjo-shu has 50% or less left from milling and added Brewer’s alcohol. If a sake is labeled Junmai ginjo-shu or Junmai daiginjo-shu there is no addition of Brewer’s alcohol. Tokubetsu has 60% or less left after milling and is a sake that has a special manufacturing method. Whatever it is that is ‘special’ about it has to be stated on the label. It is usually a premium sake. It can be Tokubetsu honjozo-shu or Tokubetsu junmai-shu (no Brewer’s alcohol added). Namazake is unpasteurised sake. Sake is generally not meant to age but is best drunk within a year of release (usually the date on the bottle). We tasted 6 sakes blind. I find that when I’m not very familiar with a particular drink it helps me a lot when I have different samples to taste. It accentuates the differences or similarities. I will refer to them according to their numbering in the blind tasting. Tombo Sparkling Bihappo Junmai Nigori Sake. Cloudy, semi-dry, fruity and fresh tasting. I have to admit I could barely taste the sparkle, but that could be due to the bottle. I could see it as an aperitive. Kubota Senju Ginjo. Clear, light, dry, refreshing, delicate in its aromas, which reminded me of cotton candy. Dassai 50 Junmai Daiginjo. Clear, very light golden, pungent, earthy, toasty. It turned out that our sample was slightly off. A second sample was offered to some, but I wasn’t one of those who managed to get one. Dassai 23 Junmai Daiginjo. Clear, with a slight golden tinge in the colour, very aromatic, brown sugar, plum with a hint of anise and nice minerality. This was my favourite. Hakushika Tokubetsu Honjozo. Clear, with a slight golden tinge, creamy, crisp, bold, dry, earthy. This was my second best. Dewazakura Ouka Ginjo. Clear, with a slight golden tinge, creamy, pungent, with aromas of really ripe melon and banana. After the blind tasting the sakes were voted on and discussed and it turned out that No 4 which was my favourite was a hit with most and voted excellent by the Sake Master himself (it turned out that it was also the most expensive at 61,90 euros a bottle). Apparently in Japan the same costs about triple the price. We were offered a small plate that contained a bit of bottarga, taramosalata, octopus, tzatziki and feta cheese to pair with the sake. This time my all time winner was sake No. 3. It paired splendidly with all on my plate. One of my co-diners had the second sample of No. 3 and he arrived at the same conclusion. I would have not easily thought of buying sake before, but after this tasting I know I definitely will; I will also convince a few of my sommelier friends that it’s a beverage worth having on their list. 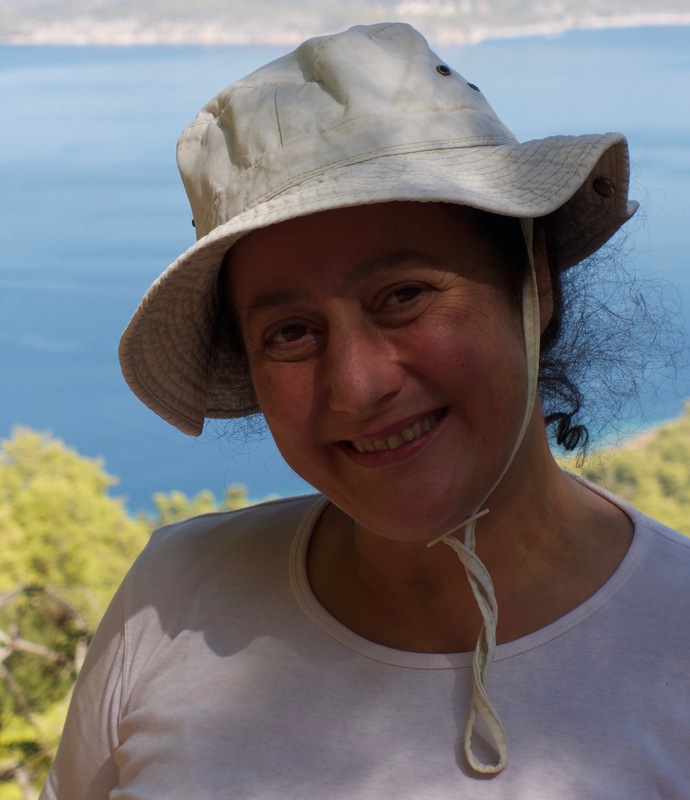 A South-African Greek who has practised psychiatry and analytic therapy for the greater part of her career, but is also in love with wine. She attained the WSET Level 3 qualification and is currently trying to blend these seemingly disparate interests. Writing about the different brews and the people behind them is her newfound interest. She will be contributing to the site on a monthly basis.